Former Education Minister addresses 2017 Jabotinsky conference warns of dangers of establishing PA state. Former Education Minister Gideon Saar, who announced his return to politics earlier this year following a three-year sabbatical, and is often touted as a contender for leadership of the Likud following Netanyahu’s future retirement, warned Thursday that the establishment of a Palestinian state in Judea and Samaria would mean the end of the Zionist enterprise. 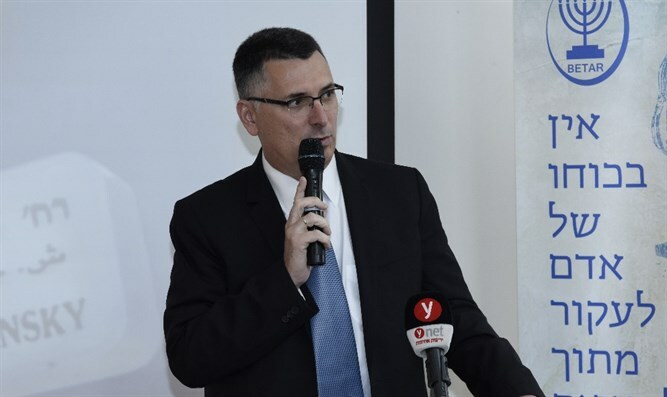 Speaking at the Jabotinsky Leadership Conference in Har Herzl in Jerusalem Thursday, Saar said Palestinian statehood along Israel’s eastern border would spark a massive wave of Arab immigration into the area, threatening regional stability. Despite the threat posed by Palestinian statehood, Saar called for unity among Israeli Jews, warning that a split between the right and left could itself be a serious threat to the Jewish state. Aside from the strategic importance of retaining Judea and Samaria, Saar emphasized Israel’s rights to the heart of the historic Jewish homeland.